These stock Maxx-sized oil-filled shocks are a perfect addition to your Clod project. This is a set of 4 shocks measuring 4" long eye to eye, and can be used on Terminator or Predator aftermarket chassis. Will also fit stock Clodbusters, but additional chassis clearance may be required. 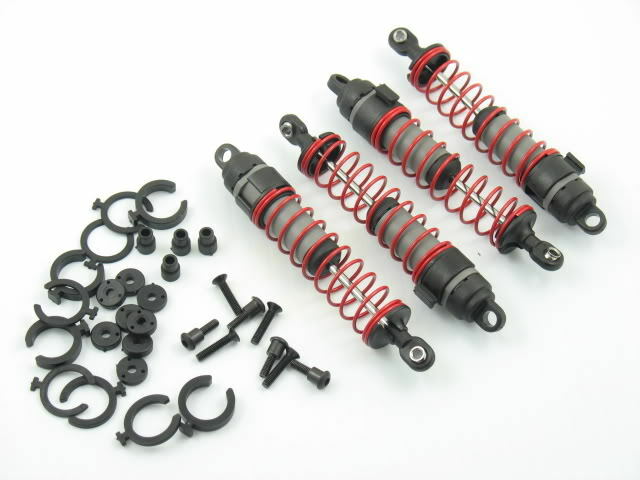 Notes: This is a set of four (4) shocks, springs, preload collars, and stock Traxxas mounting hardware as pictured. This product was added to our catalog on 05/05/2013.